February 18, 2012: A recent Vermont court decision disallowed the state legislature from shutting the plant down (not renewing its license) for safety concerns. Activism moves into high gear: see the Sage Alliance website for details, including a reactivation of Clamshell nonviolent civil disobedience tactics. August 6, 2011: articles from 2009 and 2011 added to News Reports section, below. 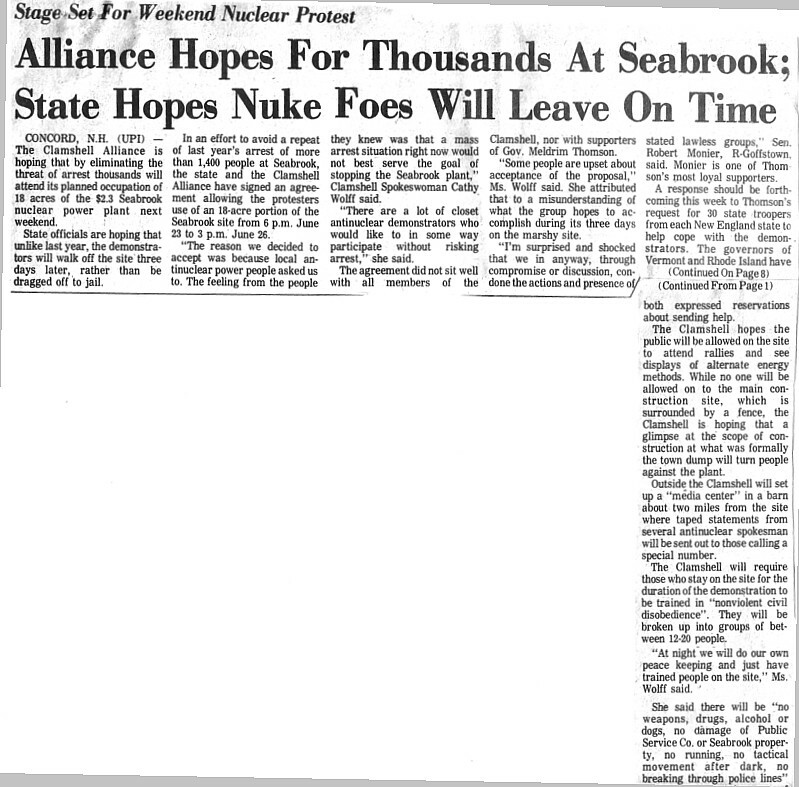 March 6, 2011: BeyondNuclear.org, which the NRC has admitted into the Seabrook relicensing hearing (with 20 years left, they already want to extend 20 years beyond that--from 2030 to 2050--see news item), has produced a youtube video "Stop Seabrook". Cronkite started the broadcast: “Good evening. The world has never known a day quite like today. It faced the considerable uncertainties and dangers of the worst nuclear power plant accident of the atomic age. And the horror tonight is that it could get much worse.” This is very graphic footage that conveys the gravity of the situation. YouTube's "related features" offer links to more material, including oral histories. Sept. 17, 2010: Why is nuclear power NOT clean? See this 10 min. video clip Down the Yellowcake Road that shows how although the mere production of electricity may be "clean," the entire fuel cycle from mining and enrichment to waste processing and storage makes it one of the dirtiest and most dangerous, as well as most expensive, electricity generation technologies around. May 17, 2009: Memorial Service for Guy Chichester at on Sunday May 17, 2 PM, at the Unitarian Universalist Church , 292 State St., Portsmouth, NH, followed by a reception at the Chichesters' house in Rye. For those of you that did not hear, our friend and longtime antinuclear, environmental, and social justice activist Guy Chichester passed away 2/8/09 at his home in Rye, New Hampshire. If you wish to bring some food to share at the Chichester's home after the memorial service, please do. Bring your favorite drinks please. 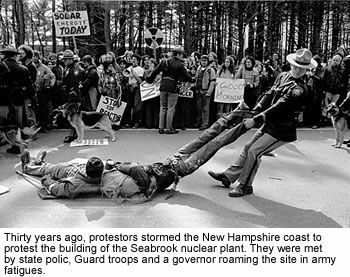 On Saturday, May 1, 1977 about 2000 people, trained in nonviolent civil disobedience and organized in "affinity groups" by the Clamshell Alliance, marched onto the Seabrook, N.H. nuclear power plant construction site, and camped out there. The next day the New Hampshire state police, reinforced by state police from neighboring states, announced that anyone who wanted could leave; anyone who remained would be arrested. Ultimately, 1414 occupiers were arrested, with transport and processing lasting into Sunday night. I was the first one in one of the first of the affinity groups to be arrested. This had several consequences: First, I was processed early and received an early trial date, so that I was one of only a couple of dozen people who were put on trial while hundreds were still imprisoned in six New Hampshire armories, refusing to post the $500 bail, thereby costing N.H. tens of thousands of dollars each day. (On May 13, all remaining prisoners were released without bail.) I pled guilty to the charge of criminal trespass, was convicted and sentenced to a suspended term (a universal amnesty was decreed in 1979). The second consequence for me was that a photographer managed to shoot some pictures of me and hide the roll of film before it was confiscated, yielding the two pictures above. Finally, although Wesleyan University allowed the other members of its affinity groups (40 total were arrested) to make up the final exams they had missed, since I had been convicted, another rule prevented me from doing that (no make-ups if convicted). I eventually received my diploma a year late, in 1979. The whole action, including the 12 days we spent, many of us hunger striking, in the Somerset national guard armory awaiting trial, were very influential in my life. 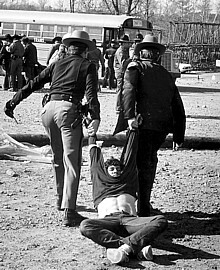 I continued participation in various civil disobedience activities, such as a die-in at the launching of a nuclear sub in Groton, Connecticut in August 1986, and at a protest against CIA recruiting at the University of Michigan campus in 1987. Anyway, I have been following the history of the site, and have collected links to numerous news reports and relevant web sites that I offer in the next section. By the way, the Seabrook nuclear plant didn't go on-line until 1990, and it was only half of the orignally planned size. 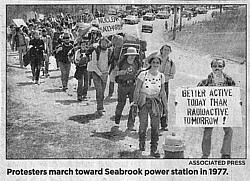 August 1, 1976: 200 protest, 18 New Hampshirites arrested at the Seabrook site. 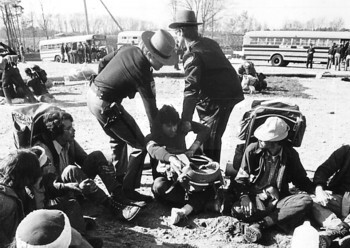 August 22, 1976: 180 activists from New England were dragged away. 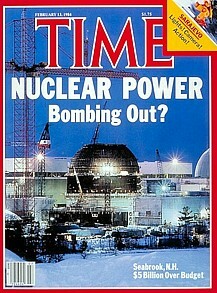 Feb. 13, 1984: "Nuclear Power Bombing Out? 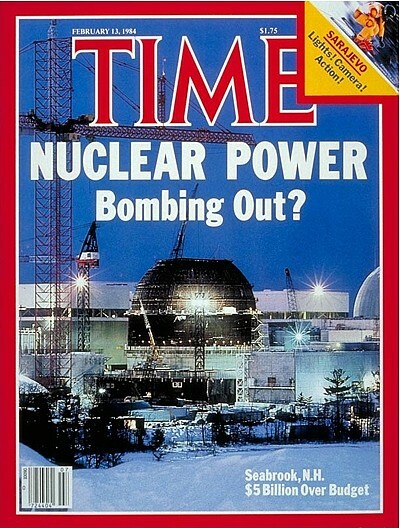 Seabrook, NH: $5 Billion Over Budget," Time cover story, with article "Pulling the Nuclear Plug" chronicles the history of the industry, implies that economic forces caused its demise in the 1980s. May 2007: "Clamshell Memories: Discipline, Humor, and the Power of Nonviolence," PeaceWork issue 375. The version at the Clamshell/Village Square website is much easier to navigate. July 26, 2009: "Seabrook through the years," by Lisa Arsenault, Concord Monitor. 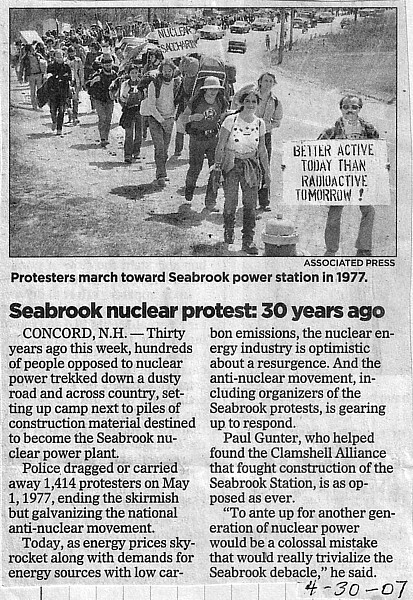 Aug. 2, 2011: "Protesters continue fight against nuclear power 35 years later," by Dave Rogers, Daily News (Newburyport). "Seabrook 1977: The Seminal Protest of 1970s Environmental Activism," 80 min. film from Turning Tide productions, with a 5-min. clip on the website. Homepage "To the Village Square"
Part 3 discusses Seabrook; with references to interviews & documents. "Nuclear Revisited: Global Warming, Electric Power, and IBEW 1245, " 16-page pdf summary discussion by Local 1245 of the Int'l Brotherhood of Electrical Workers. In-depth discussion of pros and cons of nuclear electricty (cost, safety, waste, etc.) and comparison with other methods; has 6 pages of references. Abstract: Recent research has recognized that social movements face several dilemmas in simultaneously mobilizing the many resources that are necessary for their success. This study examines some of the problems that have confronted the contemporary protest movement against the construction and operation of nuclear power plants. Its emphasis is on differences within the antinuclear movement over four strategic, tactical, or organizational matters: (1) the single-issue focus; (2) the definition of non-violence; (3) the intent of the civil disobedience committed by protesters; and (4) the use of affinity groups and a consensus style of decisionmaking. Some of the tactical problems that antinuclear protesters have encountered in the criminal courts are also identified, and implications for the resource mobilization perspective discussed. Donald W. Stever, Jr., Seabrook and the Nuclear Regulatory Commission: The Licensing of a Nuclear Power Plant (1980)($10 used at amazon). Etahn M. Cohen, Ideology, Interest Group Formation, and the New Left: The Case of the Clamshell Alliance, Harvard dissertations in American history and political science (New York: Garland, 1988). Abstract: Recent research on social movements considers collective action frames and collective identities to be resources or achievements of social movement activity because they symbolicly link individuals to a collective cause. This paper maintains that a collective action frame operates at a sociocultural level and can be redefined by groups external to a movement. 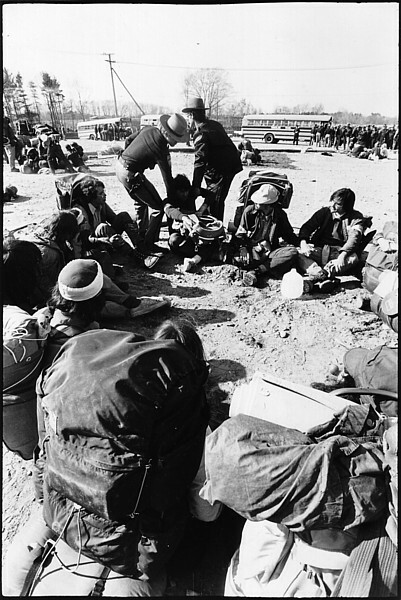 Nuclear power proponents worked to suppress the first cycle of protest against nuclear plants by redefining the movements' collective identity, such that individuals were unable to recognize movement organizations as representative of their interests. 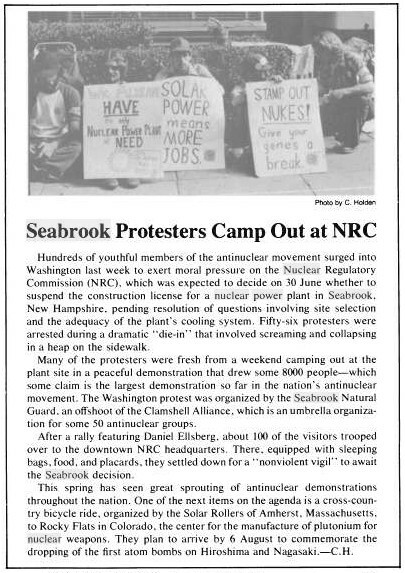 Citizens within the Ten Mile Radius, a group opposed to the licensing of the Seabrook nuclear power plant, initiated a second cycle of protest by overcoming the collective action frame imposed on the movement. This case suggests that the articulation and the representation of dissent is constrained due to the inability of social movement groups to retain control over their own collective identity. Mostly about nuclear disarmament, not power; Clamshell mentioned p. 443. Kevin McDonald, Global Movements: Action and Culture (Wiley-Blackwell, 2006), 251 pages; pp.44ff (google books link) give a summary of Clamshell's affinity groups history. These are two photos of the actual arrests, which are very rare, since the police confiscated as many films as they could. Photographer Eric A. Roth of Somerset, Mass., was able to hide one roll and smuggle it out. The 1960s and 70s were a period of change and protest against established ideas, in more ways than one: the counterculture abandoned traditional morals, the anti-war protests made the Vietnam War the most unpopular war in U.S. history, and most importantly, the new environmental movement began to reform the American lifestyle. One lifestyle change was energy consumption: while nuclear power had previously been considered “the power source of the future” (Hampton: A Century of Town and Beach), it was now the subject of much debate. Several demonstrations were staged to protest the construction of nuclear power plants around the world, and accidents, some with tragic consequences, caused public opinion to turn against nuclear power. In an interview with my father, Harold Marcuse, he describes his experience as a protester in the anti-nuclear movement and explains the larger context of his story. Mr. Marcuse’s story begins at Wesleyan University, where “Environmentalism first became a major issue…with protests against nuclear power plants.” (Roger Smith). In August of 1976, the Public Service Company of New Hampshire (PSNH) began construction of an 860,000-kilowatt nuclear power plant at Seabrook, near Hampton and Hampton Beach, New Hampshire. 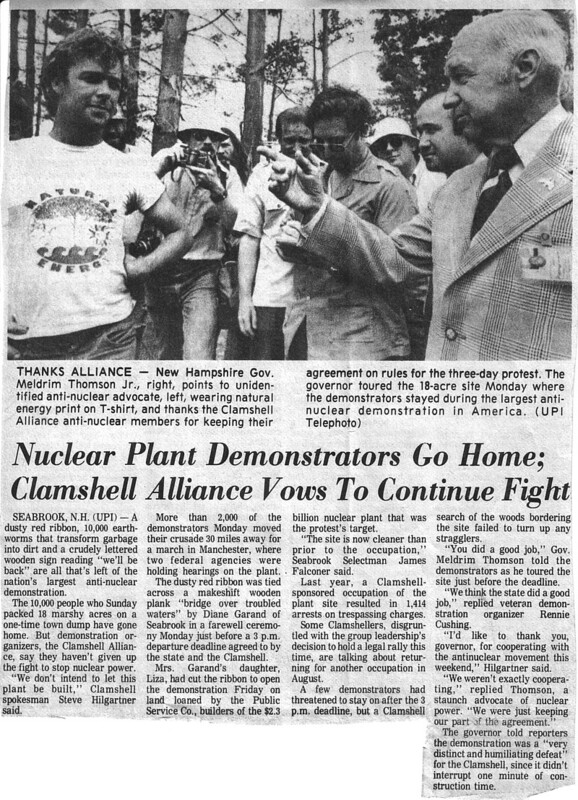 While my father was a student at Wesleyan, an organization known as the Clamshell Alliance planned a protest against the power plant on May Day, 1977. My father joined several busloads of students who went to Seabrook and joined a group of 2000 people in a massive and meticulously organized act of civil disobedience. The protesters arrived Friday and then spent Saturday preparing an elaborate camp, setting up tents and even digging latrines. Each person was part of an “affinity group” of about a dozen people, each of whom was assigned a specific task, such as cooking or taking care of medical needs. Each affinity group had a decision-making representative in a leadership group. Thus, the demonstrators could react quickly and as a unit to any challenge they might face. 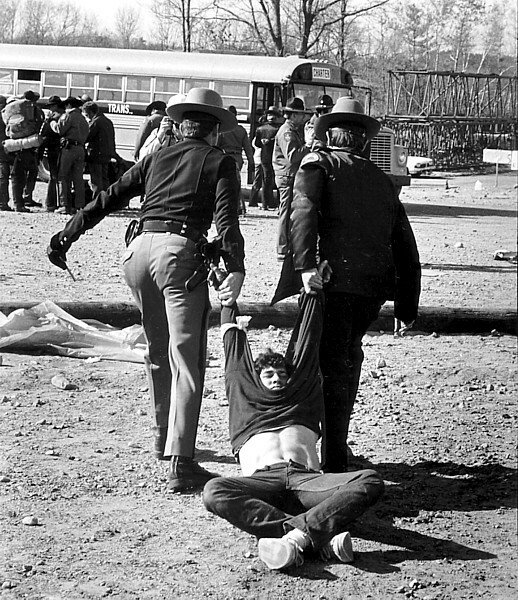 Then, on Sunday, after 24 hours occupying the site, state police came and began to arrest people. 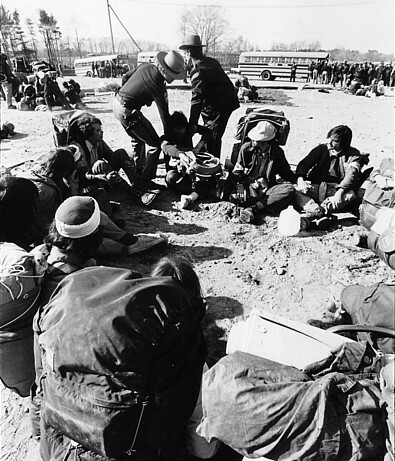 Altogether, 1414 protesters were arrested, and since there was not sufficient space to lock up so many people, they were driven to National Guard armories around the state, which were converted into makeshift jails. After waiting at the Somerset armory for about 10 days, my father was taken to one of the group trials that was held, and was eventually released. 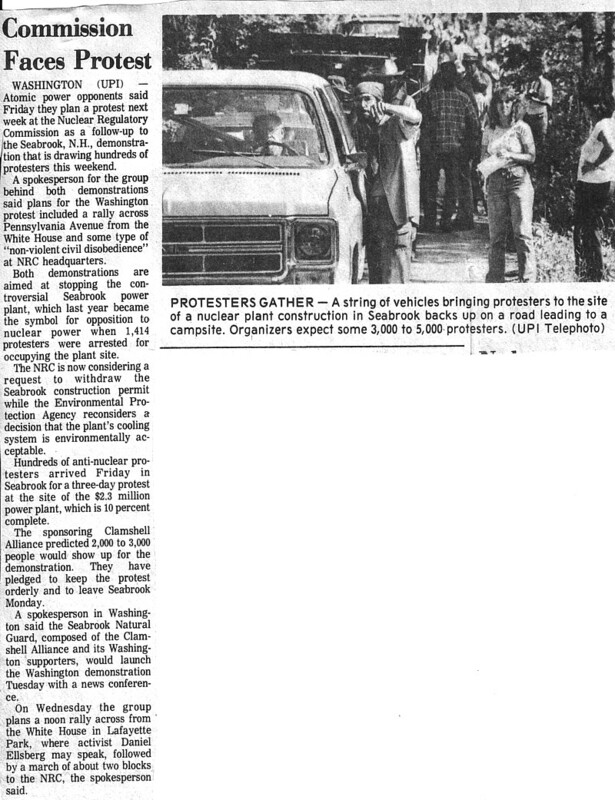 The Clamshell Alliance had vans drive protesters back to Seabrook after they were released, and my father then took a bus back to Wesleyan. Mr. Marcuse says, however, that this protest was not an isolated incident. The next year, there was a demonstration of 10,000 at Seabrook, and “The protests turned violent in 1979, when police used attack dogs, tear gas, and riot sticks to turn away some 2,000 demonstrators.” (Hampton: A Century of Town and Beach). In February 1975, in the largest anti-nuclear protest in history, 20,000 people had protested the construction of a nuclear power plant in Whyl, Germany. The 1979 movie, The China Syndrome, poses the possibility of a nuclear power plant accident caused by human error and profit-driven negligence, because as one reviewer put it, “nuclear power can NEVER be made safe because people can NEVER be perfect.” (IMDb user comments for The China Syndrome). Indeed, just twelve days after the movie was released, the fateful accident occurred on the Three Mile Island plant in Harrisburg, Pennsylvania, and while the meltdown of the nuclear core did not cover an “ ‘area the size of Pennsylvania’ ” with radiation, it did warn the public of the dangers of nuclear power (IMDb user comments for The China Syndrome) . In the Windscale fire in England in 1957 and then the tragic explosion at Chernobyl in 1986, the destructive potential of nuclear power became evident, both in immediate radiation deaths and in long-term soil, water, and food irradiation as well as increased cancer risk. Ultimately, this was the turning point in nuclear power plant construction. According to Mr. Marcuse, nuclear power simply is not worth the cost and energy required to use it. Uranium must be mined and refined, which alone takes more energy than is produced by the power plant, and then the waste must be properly disposed of. In addition, plutonium is very poisonous and has a half-life of 25,000 years, causing permanent biological damage to the environment surrounding the chosen storage location. Finally, nuclear energy is the most centralized form of power, giving power companies complete control of prices and supplies. Fossil fuels seem to provide an alternative, but they also pollute the environment, and supplies are limited. My father suggests using a renewable energy source, such as solar power or wind energy, and I have to agree, for if we are to continue consuming power for years to come, we must find a safe, reliable, and lasting resource. Hampton: A Century of Town and Beach . 1 May 2000. Lane Memorial Library. 30 May 2005 <http://www.hampton.lib.nh.us/hampton/history/randall/chap18/randall18_4.htm>. Marcuse, Harold. Personal interview. 25 May 2005. YuccaMountain.org, a comprehensive site maintained by the Eureka County, NV Nuclear Waste Office, offers a wealth of documented information. It includes maps of the storage sites that would be slated to be transported to Nevada. See especially the FAQ for a very fair assessment of the pros and cons of storage there in comparison to other options. The storage of nuclear waste is one of the critical issues that must be considered and remains to be solved before nuclear power can become a viable option as a supply of energy. Excerpted from: Hermann Scheer, " Nuclear Energy Belongs in a Museum We can meet all our electricity needs with renewable," Atlantic Times, Aug. 2008, p. 14. Scheer is president of the European renewable energy lobby EUROSOLAR, a winner of the alternative Nobel Prize, and a member of the German parliament, Bundestag. Their waste is more toxic, their reliability even less than conventional nukes. The more nukes, the more nuclear materials that can fall into the hands of terrorists and "rogue" governments (like Bush/Cheney's). Toxic radioactive waste from nukes must be stored and watched over for 100,000 years, something no government can possibly guarantee. Conventional nukes need large amounts of water to cool themselves, placing higher demand on an increasingly scarce resource and adding water vapor, a potent greenhouse gas, to the atmosphere. The heat in nuke cooling water cannot be harnessed productively. A new nuke takes (at least) 10 years to build. It must operate at full blast to be economical, no reducing for reduced load. Prices to build and maintain will only climb. They don't generate ongoing profits for corporations by scalping consumers.